Donors to Boggs Mountain Humane Shelter’s “Lucky Dog and Kitty” program believed that they were opening their hearts — and their pocketbooks — to help save the lives of sponsored animals. 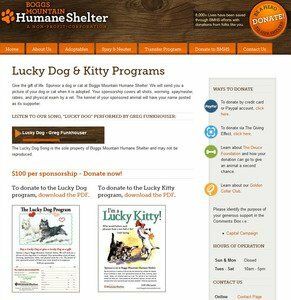 The “Lucky” program as it appears on the Boggs Mountain Humane Shelter’s website. The program was advertised as a kind of guarantee, per the shelter’s strict “no-kill” policy, that Boggs Mountain “Lucky Dogs” and “Lucky Kitties” would not be euthanized. According to an investigation by Fox 5 Atlanta I-Team reporter Randy Travis, things at Boggs Mountain aren’t what they seem. These kind-hearted donors, giving $100 to as much as $500 to help a “Lucky Dog” or “Lucky Kitty” find a home — covering medical expenses, vaccinations, and fees to make it easier for the sponsored animal to be adopted — did not know the animals they paid to protect did not live long after Boggs Mountain Humane Shelter received these donations. The Fox 5 I-Team investigation revealed at least a dozen of these sponsored pets had been put to sleep — though that’s not what the shelter told donors. The deception ran so deep that donors to the “Lucky” program received emails from Boggs Mountain claiming their sponsored animal was adopted by a loving family when in truth, the “pet” had been euthanized. Travis spoke to “Lucky Dog” donor Dede Dosedel, who gave Boggs Mountain $140 to help Pookie, a malnourished Labrador Retriever–Boxer mix she’d heard of through a friend. The reporter had to break the news to Dosedel that, despite the email Dosedel received to the contrary, Pookie had not been adopted, but put to sleep. It seems that the “Lucky” label may have made animals like Pookie a target for euthanasia. A whistle-blowing former Boggs Mountain employee, Lynne Cousins, told Travis of how shelter manager Lowanda “Peanut” Kilby pulled the “Lucky Dogs and Kitties” that were to be destroyed at the Rabun County Animal Shelter next door. Though Kilby told Travis Boggs Mountain Humane Shelter is “no-kill,” evidence uncovered during the course of the news investigation shows hundreds of animals were transferred to Rabun County Animal Control for euthanasia — keeping Boggs Mountain books clean. Kilby is also in charge of Rabun County Animal Control, Fox 5 News reports. Boggs Mountain Humane Shelter is closed, and manager Kilby is currently on suspension with pay pending a full investigation by the Georgia Bureau of Investigation. She could face charges of theft by deception and animal cruelty, Travis reports.